My children are becoming increasingly familiar with many essential oil uses in our home. I can't get over how much essential oils are changing the way I act, look at healing, cleaning, playing, etc. 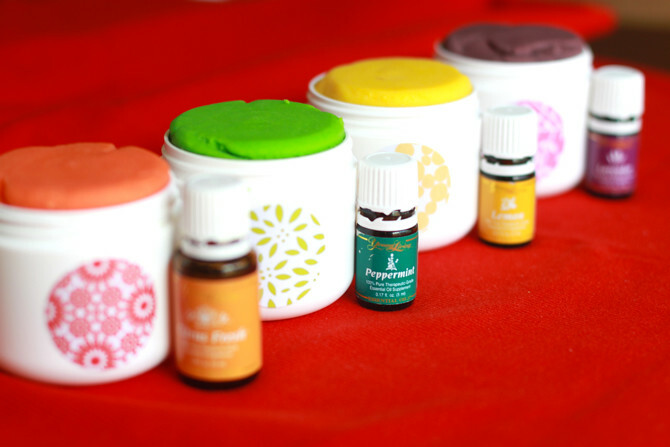 I have a few exciting recipes to share at another time of our summer's bug spray and sun soother using essential oils. 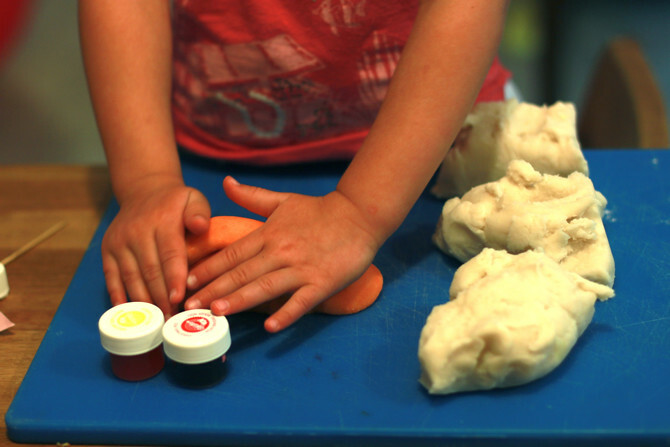 But for right now, here is a basic recipe for some pretty special homemade play dough. It has changed our usual play dough play. The added scents have added a new layer of enjoyment and fulfillment. They are calming, refreshing, and uplifting scents. 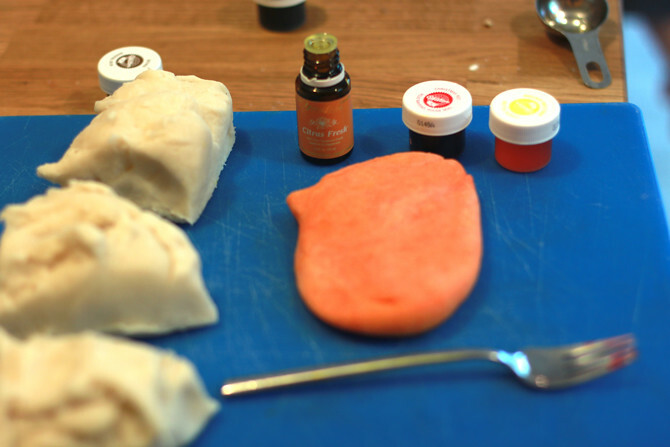 It was a thrilling process of combining the benefits of aromatherapy to the creative play activity of play dough. You've got to try it some lazy afternoon. 1. 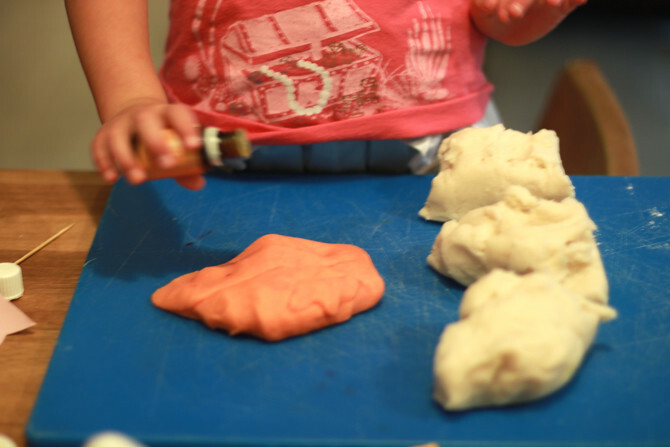 Make a batch of homemade play dough. I like Martha Stewart's recipe. See below. 2. 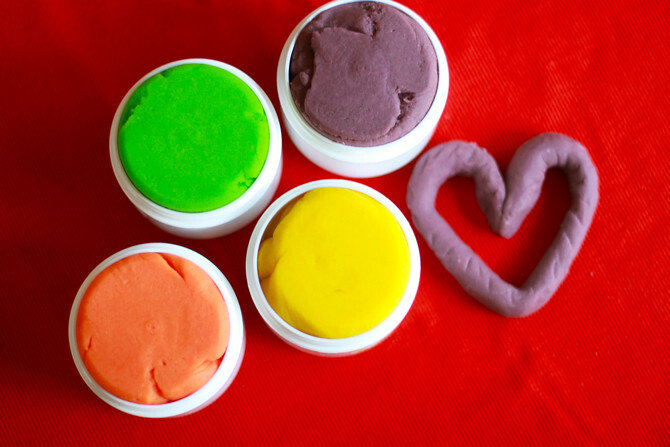 Let the kids begin adding the essential oil to the colored play dough, one drop at a time. We used roughly 8+ drops of oil per play dough portion. 3. 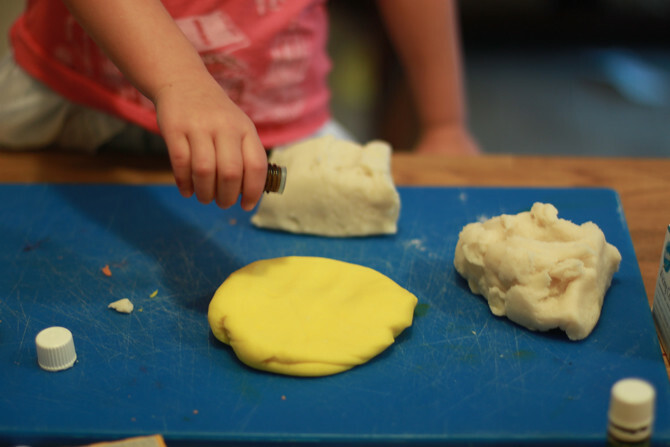 Knead the oil into the play dough. Once it is well incorporated, test the dough with the scent test: see if the scent is strong enough for the kids to enjoy. They will let you know if the scent is too weak. 4. Repeat the process for the remaining portions of play dough. 5. 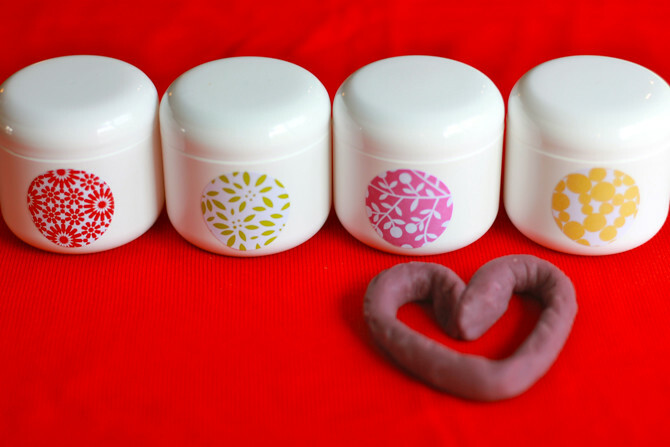 Keep the four scented portions in an air tight container. This play dough can keep for years if you contain it properly. Choose some exciting air tight jars or something special that will help your children take care of their homemade play dough. With our growing uses of oils for health and around the house, I ordered a variety of glass jars and plastic containers for special home uses. I bought these cute tubs (4 oz. plastic salve containers) for 72 cents a piece from Abundant Health, an aromatherapy supply company. 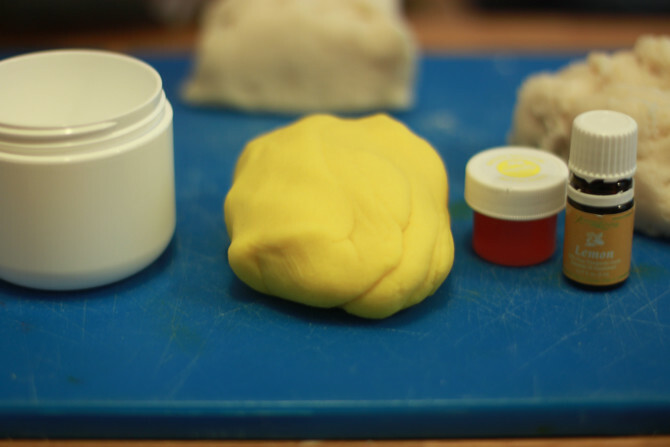 This particular play dough recipe fits the four portions almost perfectly into the little plastic containers. My kids love the change in how we keep our play dough. These tubs are here to stay. 6. 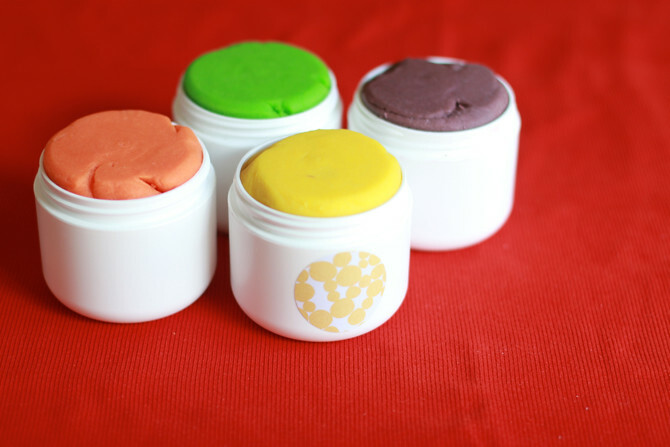 Color code the labels with the matching play dough inside each container. You can get really creative on this. I simply used some round labels. It worked out that I had a matching color label for each tub. No words, just color as the label. This is a great sensory exercise for young children to connect the colored label to the colored play dough and the matching scent. I always want to eat the peppermint play dough when it is out! 7. The best part: play, play, play! Caroline made a house with a stove, refrigerator, couch, bunk beds (that was tricky!) and table the day we made ours. 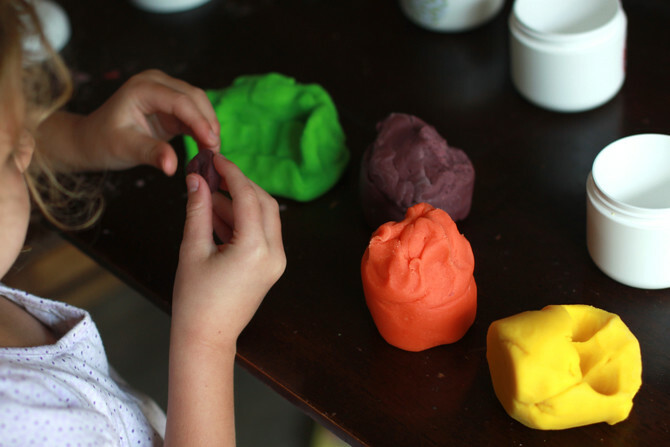 Clean up is a piece of cake since children can easily recognize which container each color of play dough is stored. 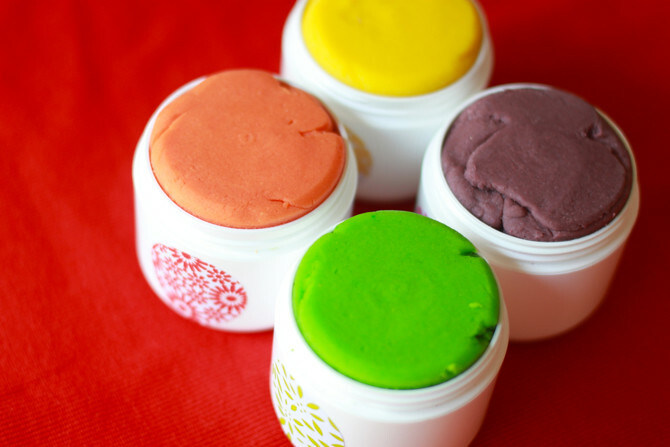 Wouldn't this set of four aromatherapy play dough be a special gift for a birthday or Christmas? 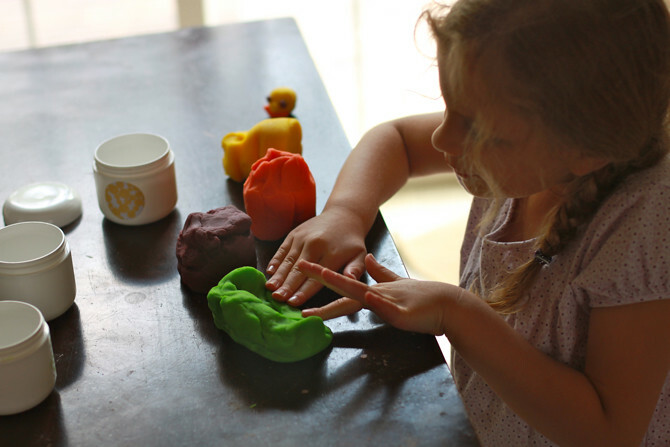 It would also be a fun play-date project to do with some little friends who could then take home their our play dough. What oils/scents would you use? What unique containers would you use?